This is my last newsletter before our new Chief Executive, David Ralph, starts next month. There will be a period of cross-over between myself and David before I leave the LEP at the end of June after five hugely enjoyable years leading a small but brilliant team! 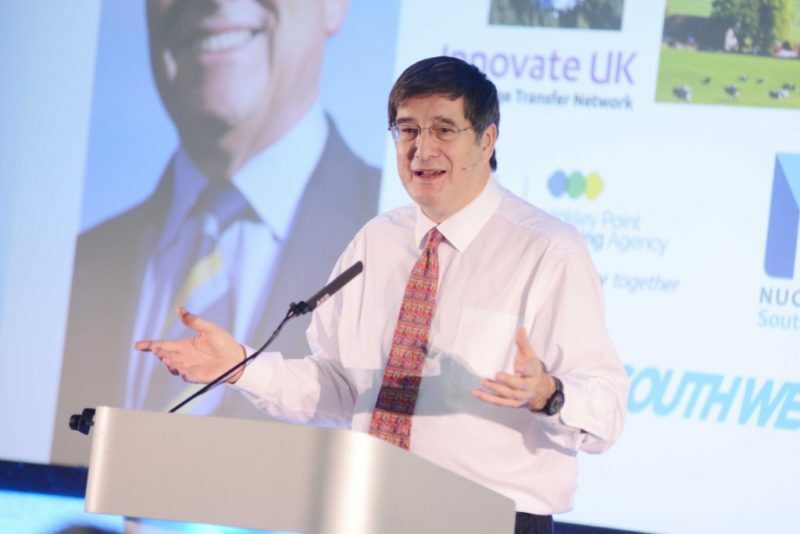 I will be heading off into retirement and am delighted to leave the LEP at the hands of a very experienced leader, who joins following several years at the helm of similar transformational organisations, including the D2N2 LEP. The Kellogg School of Management says not to worry about your first 90 days in a job, it’s your last 90 days that you’ll be remembered for. Well, that’s good news for me as the last 90 days have been quite positive! More of our Growth Deal projects are coming on stream, the role of LEPs and their influence is being strengthened by the Government; our chair, Steve Hindley, our LEP Chairman, is looking forward to a face to face meeting with the PM next month; and our partnership bid for funding to improve the North Devon Link Road, with Devon County Council, was a great success – with the full £83m being confirmed by Government. On top of this, the Housing Infrastructure Forward Funding bids from Devon – for £45m – and Somerset – for £83m – have been approved to go to the next stage; and we’ve received funding for several pilots in this area including £1.7m for the Career Learning Pilot, £500,000 for a Flexible Learning Fund, and we’ll soon be launching a Digital Pilot. We’ve also heard our area’s bid for an Institute of Technology is through to the final round. We’re growing our relationship with Innovate UK and a goal for this year is to help generate more businesses to apply for funding. We have a wealth of innovative assets in this area that have the potential to increase their productivity through grants and support, so it’s our aim to make sure these businesses know about and take advantage of what’s on offer. Another highlight of recent weeks has been that the Great South West partnership has met formally for the first time, where chief executives of the three LEPs of HotSW, Dorset and Cornwall and the Isles of Scilly joined forces with local authority representatives and business leaders from those areas. We’ll be reporting on the aims and achievements of this group as momentum builds, and already we’ve made progress on the Rural Productivity Commission delivery planning and an Energy Strategy covering the sub-region. We’re also delighted that the new Heart of the South West Joint Committee has met and that they’re focussing on the delivery plan for the local Productivity Strategy. More information about the workings of the Joint Committee is available here, and the LEP is keen to support the committee as a partner organisation. I would like to say what a pleasure it’s been to lead the Heart of the South West LEP on its successful journey – which still has many exciting landmarks ahead. I’ve enjoyed meeting and working you as partners and stakeholders in the Heart of the South West; many have made important contributions to our strategies and delivery without which our successes wouldn’t have occurred; and I hope to keep in touch with many of you on LinkedIn if our paths don’t directly cross again. More than £83 million was confirmed this month to pay for upgrades on the A361 between South Molton and Bideford. 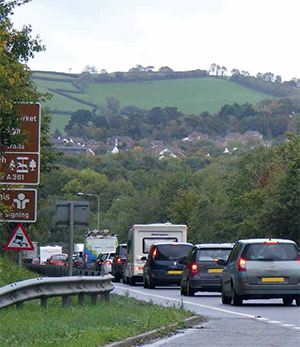 Upgrades to a number of junctions and improved connections will also provide a much-needed boost to North Devon as a place to do business. The proposal has received much support from local Councillors and MPs. “The European Regional Development Fund, European Social Fund and European Agricultural Fund for Rural Development Fund programmes will continue to be able to award funding to successful projects across England to the full value of programme allocations. For European Regional Development Funding in the HotSW area; the Low Carbon call closes at the end of May and ESIF committee in June will then review the pipeline position across all four priorities in HotSW, which are: Innovation, ICT, support for businesses and Low Carbon. On the European Social Fund, we are working with the Department of Work and Pensions to develop local calls and expect to have more information in the next few weeks. Nearly four years after the first Growth Deal was awarded to HoTSW, the projects it has funded are beginning to deliver results, with many of them completed and many more making good progress on the ground. Of the 60 funded projects, 19 are already complete, 24 are on site or underway at the project management stage and 17 more are going through the thorough business case process that the LEP has in place to ensure our funds are diligently allocated according to our growth agenda. The Heart of the South West LEP’s total Growth Deal is worth £598m; including £239m from Government and £351m match funding. Over the lifetime of the Growth Deal: 2015 – 2021; HotSWLEP estimates the investment will create up to 26,300 new jobs and 16,400 new homes. In the last few months there’s been some major milestones with a number of flagship Growth Deal projects starting on site or completing, including Exeter Science Park, South Devon Hi Tech Centre and the Somerset Energy Innovation Centre. Work has started on the construction of the £17m Hi-Tech and Digital Centre at South Devon College. The new centre, partly funded by £8.13m from the LEP’s Growth Deal, will open in September 2019 and provide a visionary centre for education and training to support the growing hi-tech manufacturing, digital and creative sectors. It was developed in consultation with over 40 businesses to create a facility for students to gain the skills that employers need in a range of hi-tech businesses such as: electronics, lasers, fibre, satellite and communications, aerospace, marine and medical. The offer will also extend to creative industries including gaming, app design, digital design, film and digital media, smart clothing and textiles and many others. By developing resources with leading companies in their field, the Hi-Tech and Digital Centre will expose future generations of engineers to cutting edge technology, and inspire the local community to take up employment opportunities in this rapidly growing sector. The interior layout has been designed to follow principles in future-proofing; with great emphasis on flexibility of space, with social and collaborative study and innovation areas that mirror workplace processes and practice. Local Growth Minister, Jake Berry, said: “With over £8.3m of Government’s Growth Deal Funding invested in this state-of-the-art Hi-Tech and Digital Centre, Government is throwing its full weight behind projects which equip the next generation with the education, skills and training to compete in a globally competitive economy. Offering training in a wide variety of different disciplines and learning areas, this centre will support local employers across multiple sectors looking for new recruits with specialist skill while also attracting new businesses to the region. 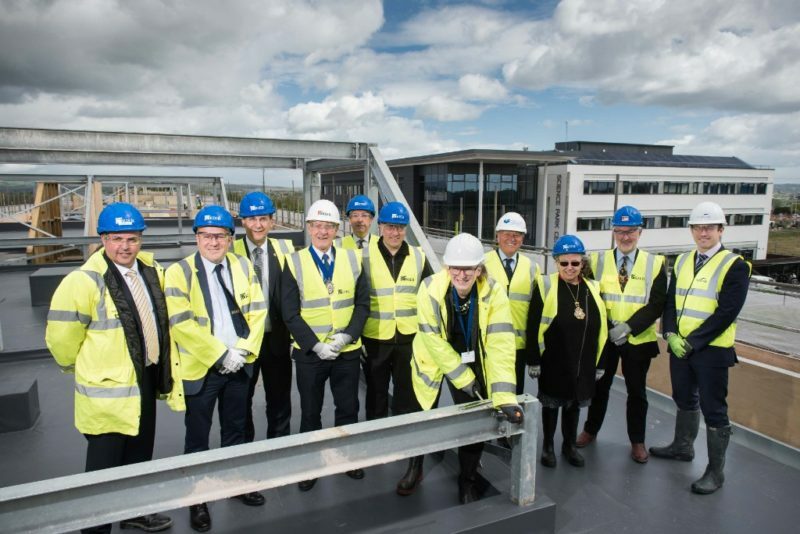 Primary school pupils from Bridgwater have been leaving their mark on the landmark Somerset Energy Innovation Centre (SEIC) by signing their names on the streel frame of the three-storey building as part of an event to mark significant progress on the project. The children, from the Eco team at Westover Green Primary School will also be creating a bug hotel on the site as part of their learning about the environment and energy. Phase Two is a major extension of the SEIC, adding an extra 2,000 square metres of floor space, scheduled to be completed by November this year. This will include a dedicated area, Enterprise Hub@SEIC2, providing light industrial and office workspace to support small and medium enterprises from any sector. Phase one of the building opened in February 2016 and is home to 40 businesses ranging from electrical engineers to facilities management. HoTSW LEP Chair Steve Hindley said: “We’re very pleased to have allocated £6.5m of our Growth Deal funding to the Somerset Energy Innovation Centre, so it’s great to see construction nearing completion. It’s a hub for ambitious companies to collaborate with each other and develop their business opportunities in low carbon and nuclear energy sectors. 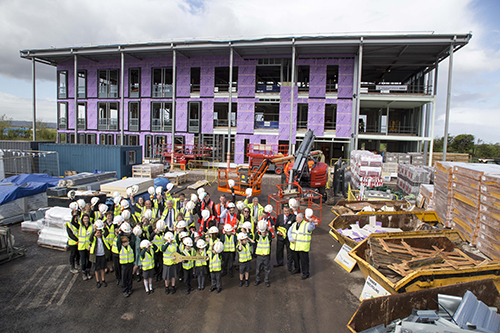 Exeter Science Park celebrated another key milestone in April with a topping out ceremony at its new grow-on buildings, which have been named by primary school students after three of history’s most inspirational scientists. The ‘Lamarr’, ‘Turing’ and ‘Newton’ buildings will provide 27,000 square feet of office and laboratory space and are expected to bring over 200 new jobs to the site at junction 29 of the M5. The Science Park is part of the Heart of the South West’s multi-site Enterprise Zones, offering reduced businesses rates and simplified planning, and this new facility provides further space for innovative businesses to grow. The Exeter Science Park ‘grow-on buildings’ are partly funded by £4.5m from the LEP’s Growth Deal Funding and Devon County Council, East Devon District Council, Exeter City Council, Exeter and East Devon Enterprise Zone, Homes and Communities Agency, and the University of Exeter. Hayley Wallbank joined the LEP last month as the new Inward Investment Manager, charged with attracting new businesses to the area and encouraging investment from existing businesses already in the Heart of the South West. Hayley brings a wealth of experience to the role, having worked in International Business Development for more than 25 years in automotive, construction, energy and engineering as well as working for DIT as a senior international trade adviser in both West Midlands and South West regions. She has helped to secure international contracts and forge global partnerships for organisations including Siemens, Met Office and ABB. She is also a keen linguist; speaking French, German and Russian for personal enjoyment as well as in her business capacity. One of Hayley’s first priorities is to work with the clusters of high value sectors in the area, including marine, nuclear and photonics, and develop collaboration to strengthen the offer for new and existing businesses. She is also working closely with the DIT to attract Foreign Direct Investment from companies overseas, and will be coordinating trade missions and visits to promote the area as a place to invest. The new South West Local Energy Hub is looking for a Programme Manager. This is a high- level role that requires effective management of a multi-agency partnership with the aim of driving investment for local energy projects. The job is based at the West of England Combines Authority in Bristol with a salary of £46,806-£51,346 dependent on experience. The Heart of the South West Growth Hub will be delivering a live Q&A session on Thursday, 7 June between 10:00 – 11:00 with the national Business Support Helpline. Centred around the topic of Productivity In Business, the Growth Hub will be answering the questions that real businesses are asking them in Devon, Plymouth Somerset & Torbay – to a live Twitter audience. Follow the Growth Hub @GrowthHubHOTSW and join in the conversation via Twitter on the 7th June @ 10.00am. Andrés Ossa, owner of Spanish Amigos Plymouth, is thrilled after receiving business support for his franchise through the Heart of the South West Growth Hub. Wanting to find a way to incorporate his customer service and language skills and learn about the Plymouth business landscape, Andrés bought into the Spanish Amigos franchise. Since receiving support, Andrés has expanded the business to offer private tuition for businesses looking to sell to overseas markets and now feels he has the confidence to take the next step and set up a consultancy business. Andres said: “Being at networking events alongside the Growth Hub meant I was meeting in the same room as peers who were facing the same issues as me. We could collaborate and share ideas amongst experts, giving each other confidence. Businesses seeking advice can contact the Heart of the South West Growth Hub here. The LEP has launched a survey to understand Digital skills capabilities and needs of businesses across Devon, Somerset, Plymouth and Torbay to help plan future training. The Government is carrying out a review of how to help businesses embrace new technology and latest management techniques to push up wages and profits. The Business Productivity Review is part of the government’s Industrial Strategy, and will help better understand the factors affecting the productivity of UK business in a bid to unlock £100 billion of untapped benefit to our economy. It will focus on how firms across the country can take advantage of leading technologies, management practices and business support services. Increasing productivity leads to a long-term boost to workers’ wages and businesses’ profits. The Business Productivity Review Call for Evidence is now open until 4 July and the government encourages businesses, trade associations and other interested parties to contribute their views. Network Rail is seeking views on proposals to build a new rail link between the Great Western mainline and London Heathrow Airport. The LEP has endorsed this scheme as it would improve connectivity between the south west and the UK’s major international airport. The south west welcomes The Trade Horizons Roadshow in June and July, a free event to prepare businesses for Brexit and ensure they can take advantage of future international sales opportunities. Over the course of two weeks this interactive event visits Exeter, St. Austell, Bristol and Swindon. Each has been specifically designed to provide all that is needed to kick start businesses’ Brexit preparations. Morning sessions will host four keynote speakers with talks from brands such as Green & Blacks, Innocent Drinks and Beer52, along with experts discussing Brexit-related issues and opportunities. Following the morning sessions, delegates are free to explore the Export Advice Zones to access a wide range of free export support tailored to business needs. More information and registration is here. The fund will help small to medium-sized enterprises in the South West (as well as the rest of the UK) access discounted lending and become involved in one of country’s biggest investment and construction projects. It is estimated that construction of the multi-billion-pound nuclear power station will put £200million per year into the regional economy and provide over 25,000 job opportunities. Small businesses can apply to the fund, more information is available here. The event is aimed at SMEs in the Construction sector to help them identify solutions and look at what the future holds for the workforce in the industry and how to bridge the skills gap, including the use of apprenticeships at higher levels. The event is free and registration is here. IMAPS UK, in partnership with the Torbay Hi-Tech Forum, are hosting the second international Conference on Packaging Technology for the Photonics and the Opto components and systems industry. The conference will meet the needs of those involved with the design of systems, development of components as well as users. More information is available here. Information on EU funding opportunities for Innovation, Social Innovation, Low Carbon Technologies, Natural & Cultural Assets, Coastal & Transitional Water Ecosystems through the Interreg France (Channel) England Programme. Gabrielle Bogart is the FCE programme facilitator for the South West of England and can help you develop your project and guide you through the application process, including helping you to find project partners in the UK and in France. For Universities, charities, SMEs, local authorities, etc.